A strong cultural belief in brand, a commitment to simplifying consumer experiences, and innovative thinking are the fuel firing Taylor Wines’ category growth, its CMO claims. The family owned winery has won several awards in the past year for its marketing efforts, including Marketing Team of the Year at this year’s Australian Marketing Institute Awards, a Bronze at the 2016 Effies Awards, Best Ad Campaign and Best Innovation at the Drinks Association Australian Drinks Awards and a B&T gong for Marketing Team of the Year. According to Taylors Wines CMO, Cameron Crowley, the brand has a long history in innovation, and was of the first wineries globally to introduce screwcaps across its entire wine range. “Innovation has to be about an engaging, new way to improve the consumer experience,” he told CMO. “It’s not just being different for the sake of it, it has to be a distinctive benefit that such change allows. It’s this very focus that led Taylors to launch the ‘Live Better by Degrees’ campaign in November last year, which run over summer months. The activity was based around introducing Optimum Drinking Temperature sensors to two core product lines, Estate and Promised Land, and was designed to educate consumers about the impact of temperature on wine consumption. The initiative resulted in a double-digit percentage increase in sales. Crowley said the idea for sensors was founded on a number of insights, the core one being that a simple way of improving the experience of wine is to drink it at the optimum temperature. Sommeliers and wine expert say a Riesling for example, should be chilled to 8 degrees, or a Shiraz to 16 degrees. 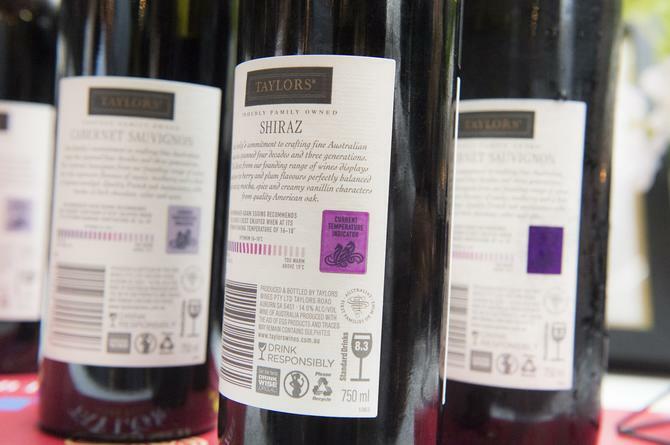 This led the Taylors marketing team to work with label suppliers and ink makers to introduce a temperature scale unique to each wine varietal. “It was about putting something right there on the pack, and making it that simple for the consumer to see,” Crowley explained. What then drove media and social interactivity was tapping into the well-understood myth that red wine should be drunk at room temperature. Consumer research undertaken by Taylors showed 82 per cent of Australians believed in this theory. Total social campaign reach, which focused on Facebook and Twitter, reached nearly 895,000 impressions, and Taylors saw 9400 engagement actions including 516 Facebook share posts. An additional 12,000 visitors came to its website, while total combined media impressions across print, digital, social, native, search, video and radio reached more than 33 million. Crowley said Taylors called on market experts including the International Sommeliers Association to demonstrate wines have an optimum drinking temperature, and also ran trials to encourage consumers to try wines in this way. “It was a big punt for the business during a key selling period, but it’s core that we stand out,” Crowley said. “You can’t just be differentiated, you have to be distinct. We knew this would deliver a better customer experience, that was a potentially powerful category building thing that would engage the consumer, and it was on brand as we were talking about innovation. Commercially, selling more red wine during the summer months also benefitted the trade, which makes a higher margin on red over white products, Crowley said. Another clear outcome of the campaign has been combatting wider price deflation in the wine market. Prior to launching last summer, 18 out of 20 top brands had taken price cuts. Conversely, Taylors had increased frontline pricing in August, and initially lost share. “This turned around when the campaign launched, and it was sustained in November through to March, when we achieved record market share,” Crowley said. During the campaign, Taylors grew its market share from 2.1 per cent in October of 2015 to 2.9 per cent. “There was a strong correlation between launching this and our profit results, and we took price in a category that had been going the other way. The next instalment of the Optimum Drinking Temperature campaign has now launched for the 2016/2017 summer season. Taylors is also exploring how to take the campaign to international markets. What helped the marketing team build internal buy-in for the disruptive campaign was the strong belief in the role marketing and brand has to play in the wine industry, Crowley said. Crowley noted that long-term consumption trends in Australia indicate people are drinking less alcohol overall. “It’s still about share gain and an ability to grow your margins and gain a premium. The only way to do that is if you stand out and mean something deeper to the consumer,” he said.